UDM Downloads > AKKSoft Webcam Capture Utility! Powerful Webcam Capture and Webcam Recording Software. AKKSoft Webcam Capture Utility is an easy-to-use webcam capture and webcam video recording software that can capture images from webcams or other capture devices on your PC and save webcam video to files with ext of WMV that can be played back directly via Windows Media Player. Webcam video files are saved in Windows Media Format. And while recording, AKKSoft Webcam Capture Utility can take static images every several seconds and save to JPG files. AKKSoft Webcan Capture Utility Features: 1. Capture webcam images directly to your hard drive. 2. Save webcam video in Windows Media file format (.wmv file). 3. Support all Windows compatible video capture devices. 4. Auto take static image files and save as JPEG format. 5. Webcam Recording and Snapshots Taking in the same time. 6. Manually take snapshots with just a click. 7. Adjust the video resolution, size and frame rate for capture. 8. Works with any Windows compatible webcam capture devices. 9. Capture images from up to 36 webcams simultaneously. 10. 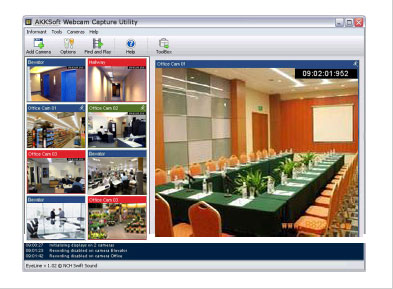 Display up to 9 live webcams simultaneously.